I usually like to start a review with something positive – in this case, I like the cover! That’s about it, I’m afraid. I really wanted to like this book, and therefore the trilogy, because the three covers together create a single picturewhich I thought was pretty clever. But that’s where my enjoyment stops. At the front cover. 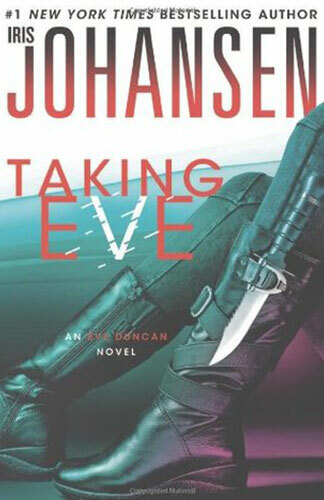 In fairness, I hadn’t realised when I began “Taking Eve” that there had been an earlier series by Iris Johansen featuring the same characters so I was behind the eight-ball from word go but still, this is supposed to be a separate series. Johansen spends a lot of time trying to clue the reader in to the earlier storyline, usually via dialogue. I think I would have preferred the dreaded info-dump from the get-go. Done this way the dialogue was incredibly forced and very rarely rang true. As a tool for filling us in on missing information, it just didn’t work. Forensic sculptor Eve Duncan’s mission is to bring closure to the families whose loved ones have vanished. She knows their anguish – her own beloved daughter, Bonnie, was taken from her when Bonnie was just seven years old. It is only recently that this mystery was resolved and Eve could begin her journey to peace. Now Jim Doane wants the same kind of answers that Eve always longed for. His twenty-five-year-old son may or may not be dead, and he has only burned skull fragments as possible evidence. But he cannot go to the police for answers without risking his own secrets and exposing his dark past, so instead he chooses a bold step to find the truth – a truth that takes Eve down a twisted path of madness and evil and into the darkest heart of her own history. Doane needs Eve Duncan’s skills and he’ll do anything to get them. Sounds reasonable, doesn’t it? Wait. Here’s what happens in the first 20 pages or so… We start with a man on a road trip talking to the charred skull of his son. Then cut to a premonition of “something bad looming” just in case we, the reader, don’t see it coming. Then there’s a woman who sees her dead daughter’s ghost. And another woman whose dog is critically ill so she accepts the help of a sociopath with the ability to control the flow of blood through a person’s body (and just happens to have a private jet) who whisks her and the dog off to a secret island laboratory where they’ve worked out how to make dogs immortal (or something!) – all with the aid of a “dog whisperer” who can speak to animals and manages to find out (from the dog) that he’s been injected with a slow-acting poison. Then the story begins: Eve is taken; presumably she’s the only forensic sculptor in the phone book. Or the only one with a dead daughter and a ghost to make the implausible plot work. To say the plot of this story is far-fetched would be an understatement. It stretches so far that the very fabric is frayed and worn like a tramps-only pair of underwear. And there’s nothing to save it. The characters are cardboard cutouts – and all of them idolise Eve. Idolise to the point that every single person in the book would be willing to lay their own lives down for her. And I don’t know why. She’s not particularly likable. The only character I cared about at all was the dog – and only because he got dragged into this story by the collar. The suspense that I was promised never happended. No, that’s a lie. I was enthralled by the chance that the bad dialogue, ridiculous plot-line and poor characters could actually get any worse. But maybe it can get worse – there’s still two more books to go to finish Eve’s story. I, for one, won’t be reading them.